The hardest part of any trip is the planning. For Jordan, the planning process was particularly hard because there is SOOOO much to do and there isn’t a ton of great online content besides what the tourism board provides. To plan my trip, I relied on the recommendations of friends as well as resources from Visit Jordan. For my trip to Jordan, I wanted to it all (or as much as I could manage in a week). I was set on experiencing and learning about the culture, seeing some of the natural wonders Jordan has to offer, and supporting local & sustainable businesses as often as possible. For your first full day in Jordan, I recommend getting acquainted with the capital, Amman. Start your day off early with falafel from Al Quds (many argue this is the best falafel in Amman). Next, explore the downtown souq area and the Roman Theatre. I recommend spending 2 hours in this area. Next head to the Amman Citadel just in time to hear the midday call of prayer echo around the city below you. To get to the Citadel you can walk (it’s mostly uphill), take a cab, or Uber from the Roman Theatre. The Citadel has the most incredible views of the city, and the buildings are interesting to explore. I recommend spending 1-2 hours there. After you are worn out from exploring head to Shams el Balad for lunch. Shams el Balad has the most incredible food and is a farm to table restaurant that supports local sustainable farmers & artists. Once you are done with lunch explore Rainbow Street. Don’t miss Souk Jara, a market off of Rainbow street. It’s a great place to find unique souvenirs from local artists. End your day with dinner at Levant. Levant is an upscale restaurant featuring cuisine from Jordan, Lebanon, Syria, and Palestine. All of the food I tried was amazing, and I recommend ordering multiple plates to share. After a jam-packed day of exploring bustling Amman, there is no better way to relax than at the Dead Sea. Spend a day at one of the many beautiful Dead Sea resorts floating on the sea, soaking up rays, and relaxing. For tips on which resort to pick and how to get there check out my Dead Sea guide. When you return to Amman, I recommend grabbing dinner at Romero Restaurant. Romero has the cutest outdoor dining space and serves terrific Italian food. Petra is an ancient city and arguably Jordan’s most famous site and is a can’t miss on your trip to Jordan. I recommend getting up very early and heading to the site so you are not exploring in the midday heat (there is virtually no shade). I recommend spending 6-8 hours here. For more information on what to see in Petra check out my Petra guide. Instead of going back to Amman after Petra, head to the Wadi Rum desert. There are a number of night camps (most are glamping) that you can stay at. Many are run by Bedouin families. I recommend booking Beyond Wadi Rum (where I stayed). The camp was clean, the food was great, and a great price (around 35 USD for 2 people). The Wadi Rum desert which is hands down one of the most incredible places that I’ve been to. After a night of glamping wake up to watch the sunrise across the entire desert. Gazing at such an expanse paired with absolute silence is surreal. It’s so quiet that little birds flying above sound like airplanes. After breakfast at your camp, I cannot recommend enough doing one of the day excursions your camp offers. We hired a jeep & driver for the morning a hiked through canyons, saw ancient cave drawings, drank tea in Bedouin tents, and even came across some mountain goats during a hike. It takes about four hours to get back to Amman from Wadi Rum, so I recommend hitting the road in the early afternoon to avoid driving in the dark. One of my favorite things to do when I travel is to support local businesses and meet locals. Iraq al-Amir is a town on the outskirts of Amman and is home to an old castle and a Women’s Cooperative. The Cooperative is run by local women and provides training and jobs for many local women. The cooperative was established by Queen Noor’s foundation. I recommend calling ahead and eating lunch at the Cooperative (your hotel can help with this). The women that run the cooperative are warm and kind. Spend time learning about the pottery, paper, and other crafts they make. I promise you it will be a truly amazing experience. Because the cooperative is outside of Amman I advise against Ubering here (it will be hard to get a ride home). We used our hotel’s driver, but you can also rent a car to get here. After you have lunch at Iraq al-Amir head to Jerash, Jerash is a town North of Amman and has well preserved Greco-Roman ruins. Spend half a day here exploring the city and learning about the ruins. There are so many things to do in Jordan, that it is hard to fit them all into one week. Here are some ideas of other ways you can spend your remaining time in Jordan. One day is not enough to truly experience Amman. Since the primary purpose of my Jordan trip was to attend a wedding I spent a lot of time in the capital city and grew to love it. Um Qais is in Northern Jordan and is known for great hiking if you are looking to try something a little different head north and hike. There is a tour operator called Baraka that I’ve heard great things about. Spend a day kayaking or canoeing in Wadi Mujib Canyon. One option I looked at for my trip was spending a night in Aqaba and diving/snorkeling in the Red Sea. Aqaba is near the Wadi Rum desert and is an easy place to visit after Wadi Rum. 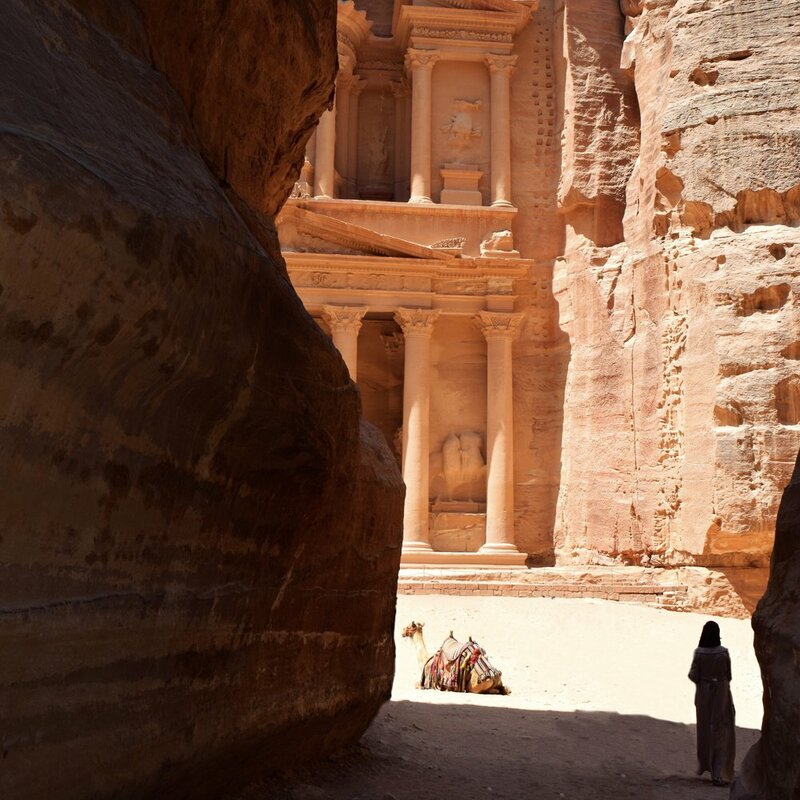 Just a couple of hours outside of bustling Amman is an ancient, remote, and extraordinary place called Petra. The road to Petra is dusty and windy. When visiting you should be prepared to walk through narrow canyons & dusty paths to reach arguably the most Instagrammed location in Petra - the Treasury (Al-Khazneh الخزنة). The Treasury was built in the 2nd century BC and is one of many amazing structures that make up the ancient city of Petra. As a self-proclaimed history nerd, I was captivated by the mere idea of visiting this famed archeological site. One of my only regrets from my trip to Jordan was not spending more time in Petra. Petra can be reached a number of ways. There are tours available from both Amman and Aqaba which can be great options if you have limited time. It’s also easy to hire a driver through your hotel or on Viator to take you to and from Petra, but it may be expensive. Finally, the most budget-friendly and flexible option is to rent a car and drive. Driving in Jordan is not for the faint of heart - the normal rules of the road do not seem to apply here. Cars are constantly passing each other (often without turn signals) and you may even end up sharing the road with a camel. After consulting with friends, we opted to pick up our rental car from the Amman airport (Queen Alia International Airport) to avoid driving in the chaotic city center. The drive from the airport was about three hours. We encountered limited traffic and a few security checkpoints along the way. Regardless of which way you decide to reach Petra make sure you bring your passport since you or your tour/driver may be stopped at a checkpoint. There is virtually no shade in Petra so the earlier in the day that you visit the better. I recommend packing lots of sunscreen, wearing a hat, and dressing in breathable and light-colored clothing. It took us a while to get our rental car so we arrived at Petra around 11 AM. Hiking in the midday sun was not fun, especially in the August heat. In general, spring and fall tend to be popular times to visit Petra because the weather is more temperate. When choosing the time of year to visit Jordan and Petra be cognizant of rainy seasons. Petra is known to have flash floods and there is a chance of closure during the rainy season. There was minimal risk of rain when we visited in August, but the heat was exhausting. I wish I had spent more time in Petra because there is so much to see. The most well-known sites are the Treasury and the Monastery. The Monastery was by far my favorite site in Petra. Extraordinarily, the Monastery is a massive structure that was built as a Nabataean tomb. It is believed that it may have been used as a church at some point. What makes the Monastery so amazing is how well preserved and massive the structure is. It’s incredible to think that it was built in the 3rd century BC. From the entrance of Petra, it’s about a two-hour hike to the Monastery so I recommend going straight there to avoid the midday sun and visit other structures on your walk back. It’s estimated that only 15% of Petra has been uncovered (the rest is still underground). It’s shocking how much of the site remains to be discovered because there is so much to see. Besides the Treasury and the Monastery, there are a number of other interesting sites in Petra. Some popular attractions are “the tombs,” High Place of Sacrifice, The Great Temple, and The Theatre. One of the best ways to see Petra is by night. A portion of the site is lit up with candles every Monday, Wednesday, and Thursday. I didn’t have time to see Petra at night (one of my regrets), but if you have the time I’ve heard it’s incredible. Next time I’m in Jordan it’s definitely on my list. Nearly every corner of Petra is #Instagramable, but there are a few spots that I loved for getting that perfect shot. Before I hop into recommendations I want to call out-out the need to exercise caution when attempting to get that perfect shot. Petra is an archeological site and there are a lot of cliffs, drop-offs, and loose rocks so please stick to the trails. No picture is worth harming yourself, others, or this incredible site. Also, I highly recommend wearing sneakers/hiking boots for exploring Petra. If you need special shoes for that perfect shot pack them in your backpack. Yes, the hike to the Monastery is more than worth it for the picture alone. There are a number of Insagramable spots near the Monastery, but my favorite is a cave directly behind the cafe that is located from across the Monastery. The cave is maybe a 30-meter walk uphill behind the cafe (you can’t miss it). The view from on top of or inside the cave offers a unique perspective and makes for the perfect Insta. The view from above the Treasury is incredible, but you won’t want to attempt reaching this spot without a guide and good shoes. Guides wait nearby the Treasury and you can easily negotiate down their rates (I believe we paid 6 JD for 2 people). The hike is more like a climb up a rocky cliff, but the view is more than worth the trek and 6 JD. One of the most Instagramable spots in Petra is the easiest to get to. The Siq, which is the narrow pathway you take into Petra is not only eerily beautiful but the perfect place to capture a picture. My favorite view is the walkway when you start to see the Treasury peaking from behind the rocks. For more planning tips for Petra I recommend using the Visit Petra site. There is a ton of great information including maps, information about local accommodations, and details about the different sites. Also, if you haven’t already - buy the Jordan Pass if you plan on visiting Petra. The pass covers your entrance fee for Petra (for 1 or more days depending on the pass), your tourist visa, and entrance to many of Jordan’s most popular sites. I ended up saving money by purchasing it.